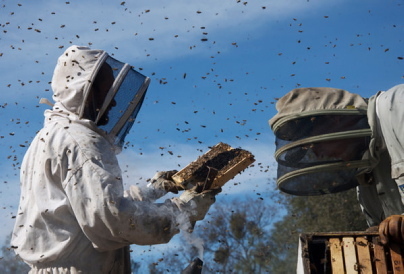 The documentary explores the collapse of bee colonies. “MORE THAN HONEY,” directed by Markus Imhoof, 2012. The latest estimates suggest that in the United States, a total of 1.5 million beehives (out of 2.4 million total) have disappeared across 27 states. In Germany, according to the national beekeepers association, one-fourth of all colonies have been destroyed, with losses reaching up to 80 percent on some farms. Depending on the world region, 50 to 90 percent of all local bees have disappeared, and this epidemic is still spreading from beehive to beehive – all over the planet. Scientists have named the phenomenon “colony collapse disorder,” and they have good reason to be worried: 80 percent of plant species require bees to be pollinated. Without bees, there is no pollinization, and fruits and vegetables could disappear from the face of the Earth.